From the fertile mountainous hillsides of Da Lat to the beautiful city by the bay, Nha Trang, Kim’s uncle Anh Dung would boast that there’s no country in Asia that has such a diverse geography like Vietnam. He insisted we visited Nha Trang and even payed for our transportation despite our protests. Located in the south central Vietnam coast, Nha Trang has a mild climate year round and is one of the major tourist destinations in Vietnam. Known for it’s white sandy beaches and crystal blue waters, it’s a major destination for rest and relaxation among locals and foreigners alike. But escaping to Nha Trang doesn’t mean there’s a lack of great food. 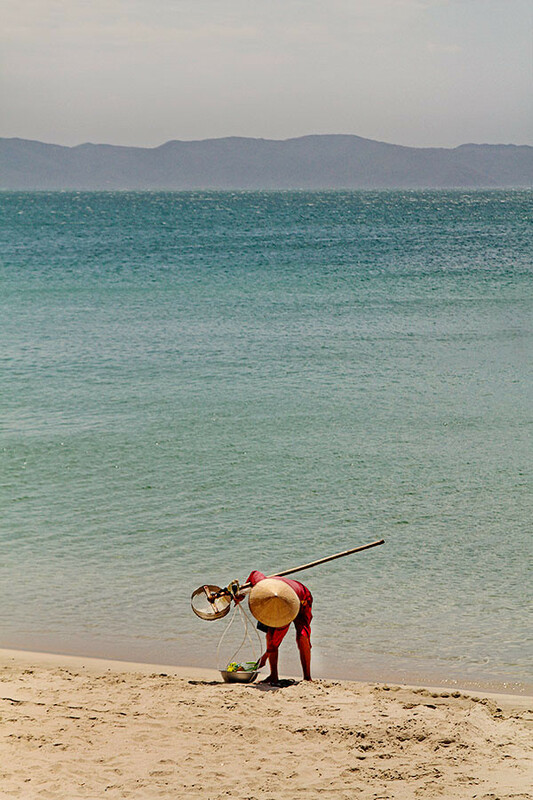 We escaped the noise and congestion of Saigon to take in the sands, mud baths, and of course the special delicacies of Nha Trang. It’s no surprise that our first bite in Nha Trang involved seafood–more specifically fish and jelly fish (sứa) in a dish aptly named called would bún cá sứa. 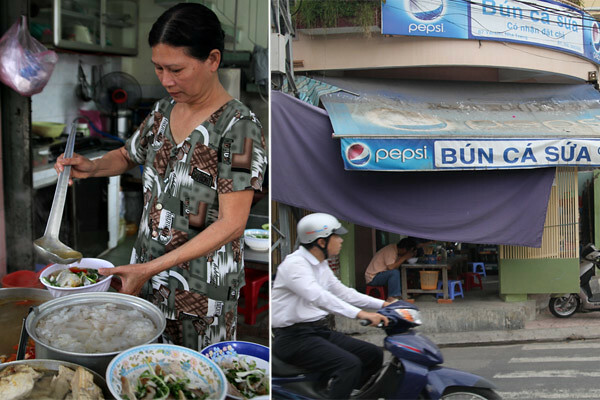 The locals directed us to a street side restaurant opening to the sidewalk, aptly named Bún Cá Sứa since it’s the only thing they serve. 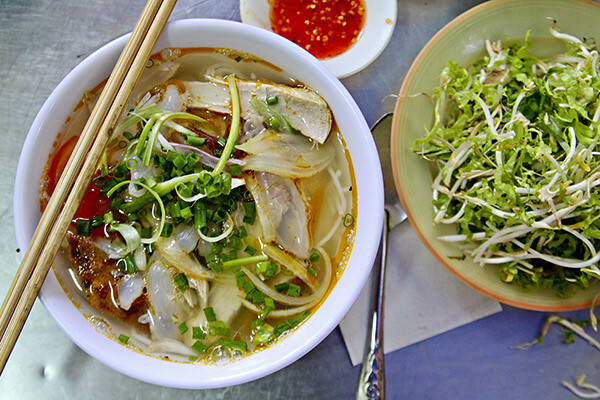 We love that about Vietnamese restaurants–no frills and to the point —no menu needed. 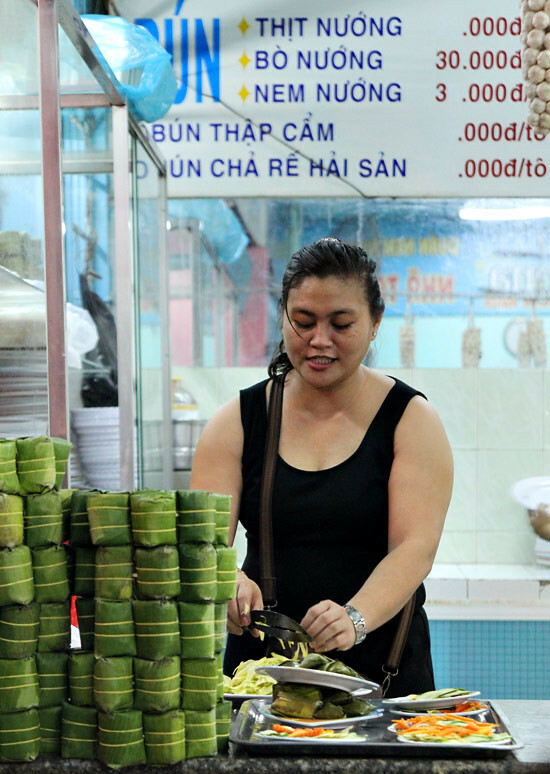 Like many vermicelli noodle soups, bún cá sứa is often eaten for breakfast but can be eaten at any meal. 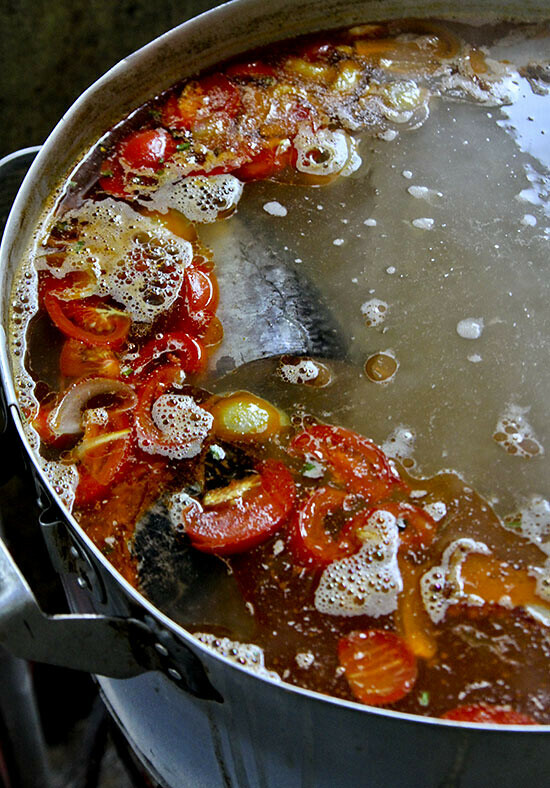 It’s a delicate broth made from large steaks of meaty white local fish and fish bones accented by tangy tomatoes and red annatto seed oil. The jelly fish is actually more complementary and added like a condiment along with chunks of meaty white fish, and a variety of chả cá (fried fish patties). Just barely cooked, fresh jelly fish is firm and not at all slimy like one might think, and is rather tasteless but adds a textural punch to the dish. 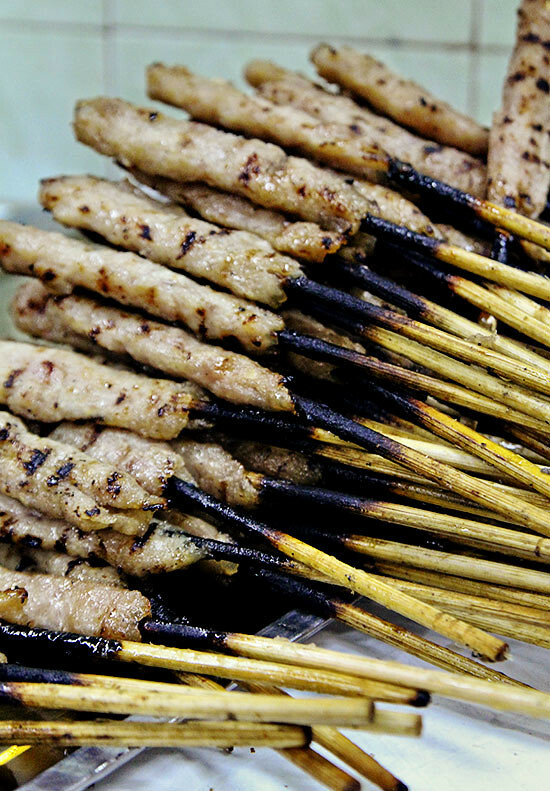 Another must eat specialty this south central province of Khanh Hoa, and not just Nha Trang, is grilled pork skewers, nem nướng. Our destination is also aptly named Quán nem nướng Ninh Hòa Nha Trang. Here the pork is boldly seasoned with garlic, sugar, and black pepper is pounded into a paste and wrapped on bamboo chopsticks and grilled to perfection. It’s served with a platter of fresh herbs and pickled vegetables and everything comes together by wrapping it all in rice paper and dipping it into a special sauce. 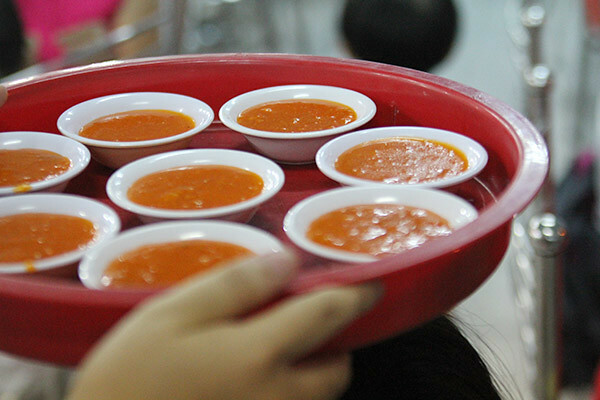 Instead of the ubiquitous nuoc mam cham or a peanut sauce, the people of this region created a sweet and savory orange colored syrupy sauce with bits of pork and shrimp..and perhaps annatto or tomato. Popularized in Southern California by Brodard’s restaurant, the orange secret sauce is quite common in this region. We’ve yet to crack the recipe as the locals were quite guarded when asked. The restaurant also serves a variety of grilled meats as well as a delicious nem chua, a fermented pork that’s wrapped in banana leaves,stacked high on the restaurant counter. The best part is that all the grilling doesn’t happen behind the seens in the kitchen, but right on the side walk, luring you in with the intoxicating aroma of charred grilled nem nướng. 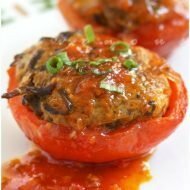 Quán nem nướng Ninh Hòa Nha Trang 69 Nguyen Thi Minh Khai Nha Trang. Both the food and place looks phenomenal! looks good. one of the places in da nang that serves banh xeo (banh xeo ba duong) as well as nem nuong adds liver to their sauce, which creates for interesting flavor/texture. 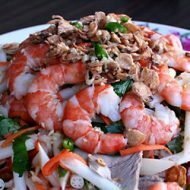 By far the best food blog about eating in Vietnam…. I wish I had the chance to try the Bun Ca Sua (to be honest the jellyfish put me off – I know, I know, I should have been more adventurous), but did fall in love with Bun Cha – often eating so much I had to lie down afterwards and the nem nuong alwys smelt so good I couldn’t pass by without tasting a skewer or three. I love Nha Trang, can’t wait to go back. I am ravishingly hungry and am now in Nha Trang. 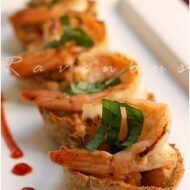 Thanks for the lead on the nem nuong place. Will go try it tonight after the temperature drops a bit. Just back from a great late lunch at Quan’s Naem Nuong . It is now located at # 39 on the same street, just a couple blocks closer to the beach and my hotel. The new location looks like it could seat 250 at once. Will return tomorrow for one more meal!